When it comes to choosing a seaside sun holiday in the UK, there’s no real better choice than the Isle of Wight. Set back from the mainland by an expanse of sea, accessed by ferry and surrounded with beautiful landscape, countryside and award-winning beaches, there’s really no better place to go for a relaxing break away this summer. When staying on the Island, there’s no real better option than to stay in Shanklin. The traditional village has been married with some of the Island’s best attractions and eateries, to create a perfect place to stay to experience all the Isle of Wight is really about. Until the second half of the 18th century Shanklin was a sleepy little village consisting of a handful of fishermen’s cottages (some of which can still be seen), a grand Manor House and the family chapel that was built in medieval times, and expanded to become the St Blasius Church seen today. For a stay steeped in British history, there can be nothing more relevant than a wander around the old village in Shanklin. For those looking for upmost relaxation and leisure, Shanklin beach awaits. Nestled only a short walk away from the town centre, the golden beach is machine cleaned and litter picked on a daily basis to ensure that it awaits you clean and perfect every time. The beach itself is a brilliant site to enjoy watersports of all kinds, and you can often see enthusiasts of all abilities taking part in surfing, sailing, water-skiing and more. Whether you’d like to join in, or simply spectate, the golden sands of the beach provide a perfect spot for it. Sometimes, the British weather doesn’t hold out. Even on the glorious Isle of Wight, it may sometimes rain. On days like these, there’s nothing for it but a trip to the wonderful Shanklin Theatre. A source of community pride and spirit, the Shanklin Theatre continues to create some of the most loved shows and events across the whole Island. There’s always something to see and hear at Shanklin theatre, at any time of the year – including a professional summer season. Whether you want to laugh, cry, sing or dance, there’s bound to be something on at the Shanklin Theatre for you. When staying in Shanklin, there’s only one place to stay to ensure the finest location offering sea views, a short walk to the beach and the town. The Clifton's privileged location on the Shanklin cliff top offers an amazing sea view and makes it an ideal retreat for those in search of tranquility. The stunning view of Shanklin bay can be enjoyed from the Clifton's Bistro, where you can order fresh fish from the daily blackboard. 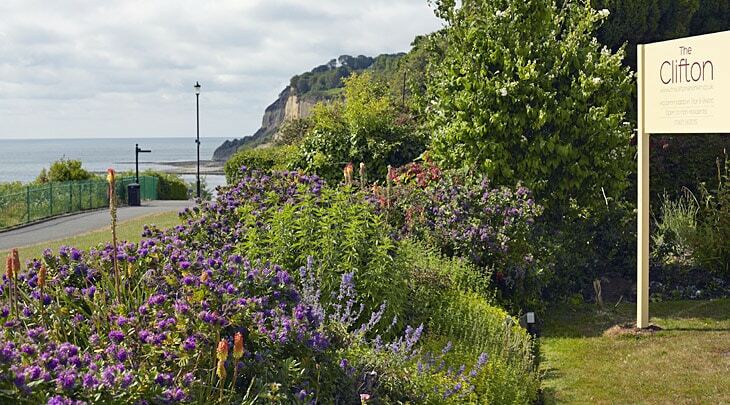 In the lovely cliff top garden guests can also take advantage of the fabulous sea view, warm Isle of Wight sunshine, wonderful sea air, and refreshments from the licensed bar or just a cream tea with homemade scones or cake. Take a look at what the Clifton has to offer, and book your room online.